U.B.U. & i.b.i…… It’s my feeling that everyone shares a common desire to be the person they want to be. They want to live the life they want o live, and leave behind them a better world for their family and friends. As complicated as our world can seem at times, a simple message is often the most profound. We ‘can’ make our world a better place to live in if follow the direction six little letters; U. B. U. 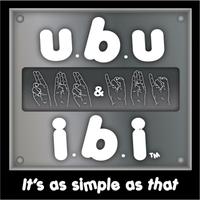 & i. b. i…… You can be you and I can be I, believe and practice this idea and peace will follow. Tell your friends, spread the message, it’s as simple as that.